For over a quarter century, Le Cirque has remained the gustatory temple at the epicenter of New York's social, business and power dining scenes. 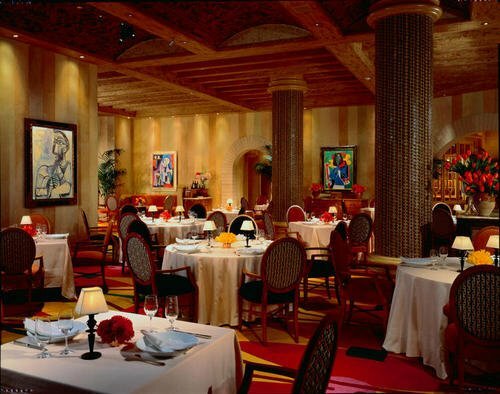 Ringmaster Sirio Maccioni, long recognized as the "world's most charismatic restaurateur," brought his Four-Star culinary magic to the Las Vegas Strip with the opening of the bellagio . Perched astride an eight-acre lake filled with dancing fountains, Le Cirque is a whimsical jewel box of color and detail, from the star-studded entry of polished woods to the sumptuous, swooping silk-tented ceiling. Le Cirque offers animated surroundings with vibrant French cookery that is by turns rustic and elegant: Braised Rabbit in Riesling with Spaetzle, Fava Beans and Wild Mushrooms; Roasted Chicken in Black Truffle Skin with Roasted Potatoes and Lobster Salad "Le Cirque" with Black Truffle Dressing.